The world's first electric roadway, which can charge commercial and passenger vehicles while on the move, has opened in Sweden. An electric truck working for the logistics company PostNord will over the next 12 months use the road to stay charged as it shuttles deliveries between Arlanda Airport and its distribution centre 12km away. The truck has been fitted with a connector underneath its chassis which attaches to an electrified groove in the road, drawing power like a car on a Scaletrix track. 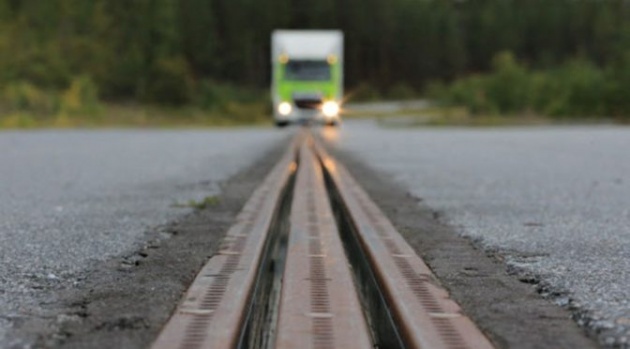 "Everything is 100 percent automatic, based on the connector magnetically sensing the road," Hans Säll, Chief Executive of the eRoadArlanda Consortium, told The Local. "As a driver you drive as usual, the connector goes down onto the track automatically and if you leave the track, it goes up automatically." He said that in a commercial application, it would be easy to handle billing and permissions. "You can send data through electric cables, so it's no problem to identify the car, and the rail will know if you are allowed to draw electricity or not and it will be able to charge you."